Researchers see great promise in eDNA testing to detect invasive and rare species at low abundance — including invasive Asian carp — but refining the tool is a long process. Testing water samples to search for environmental DNA (eDNA) of invasive Asian carp in the Great Lakes and connected waterways has given rise to many alarms, but few answers. Interim results from a federal study, released February 22, confirmed what many have long suspected: sources other than live fish can trigger positive eDNA hits in water samples. Ice used to store Asian carp sold in area fish markets, which melts and flows into storm sewers. eDNA from this source dissipated in the CAWS within one day during trials. Fishing gear, such as boats and nets used by anglers and natural resource agencies, was found to carry Asian carp DNA, even after being transported over land. Fish-eating birds can deposit Asian carp DNA in their waste, where it can persist for 30 days. Dead Asian carp on barges can be a source of eDNA in water that has washed over the dead fish, and this can persist for 18 days. However, only five Asian carp carcasses were reported on barges during the 2012 shipping season. River and stream bank sediments can carry eDNA from Asian carp. Silver, bighead, grass, and common carp are invasive species that can disrupt aquatic food chains and out-compete native fish. Native to Eurasia, they escaped from aquaculture facilities in the southern United States in the 1970s and have since infested a large area of the Mississippi River Basin. If the carp reach the Great Lakes, many believe they could severely damage the region’s $US 7 billion sport-fishing industry. Results of eDNA testing, utilized since 2009, have sparked alarms that the carp are much closer to the Great Lakes than the official “invasion front” identified at Dresden Island Pool on the Illinois River, 29 kilometers (18 miles) from electric dispersal barriers that are meant to stop the fish and 89 kilometers (55 miles) from Lake Michigan. The testing has even suggested that some carp could already be present in the lakes, but eDNA findings are frustratingly inconclusive. First applied to search for Asian carp by University of Notre Dame researchers, the method detects DNA from skin, mucus, scales, and other materials in water samples, which can then be traced back to a distinct species using genetic markers. But currently, the tests cannot say where the DNA came from — live fish or other sources — and cannot determine how many fish might be in the area. Baerwaldt is part of a team of researchers from the Corps of Engineers, U.S. Geological Survey (USGS), and U.S. 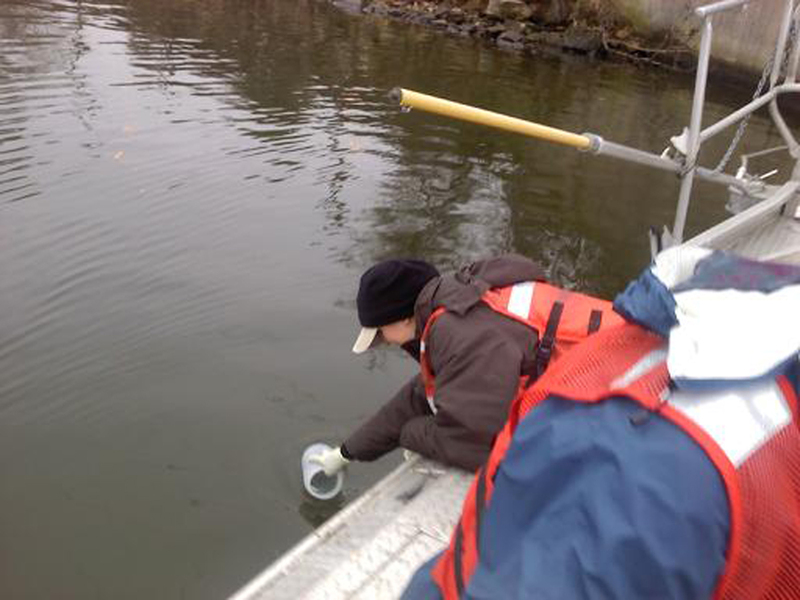 Fish and Wildlife Service (USFWS) that is working to refine the relatively young science of aquatic eDNA testing as part of a 3-year federal study known as the Environmental DNA Calibration Study (ECALS). The recently released interim report on potential eDNA sources — or “vectors” — comes from the larger ECALS effort. “ECALS is showing us how [eDNA] works and how it doesn’t,” said Duane Chapman, research fisheries biologist at the USGS Columbia Environmental Research Center. 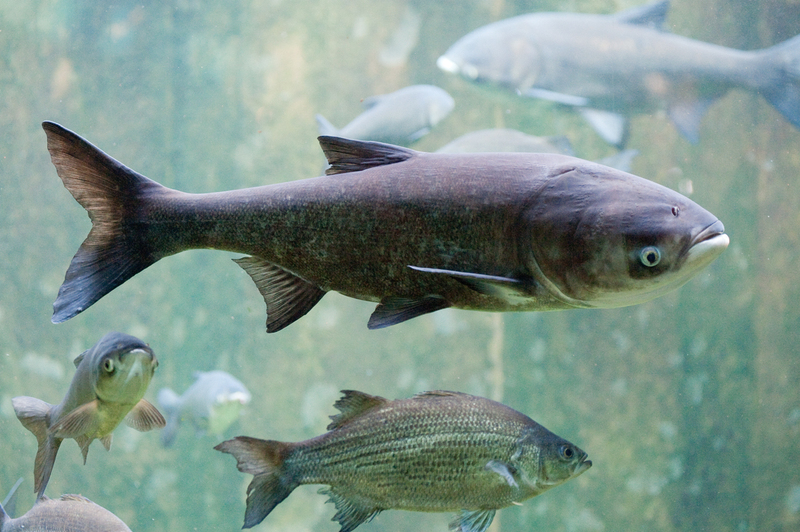 The recent study results make eDNA more difficult to interpret, he said, adding that the presence of large, established Asian carp populations so near to the CAWS, coupled with the numerous eDNA vectors in the area, make it a “worse case scenario” for trying to detect carp. Furthermore, researchers have found chemicals present in some water samples that inhibit the detection of carp DNA. These “inhibitors” can be naturally occurring—algae that the carp like to eat appear to be one inhibitor—and create false negatives. There are ways to counteract inhibitors in most cases, but they must be identified first. Identifying inhibitors, developing more advanced genetic markers, and modeling how eDNA moves through the water system are projects that the ECALS teams are working on now. In the past, positive eDNA hits have been followed up by extensive searches for live fish in the area where the water sample was collected, a significant investment of time and money. Baerwaldt explained that action will still be taken if live fish are found, but the presence of eDNA alone will not be such a trigger. “We have to reevaluate the things we thought it meant earlier because of the ease at which the DNA can be moved around and the length at which it stays in the environment,” Chapman said. 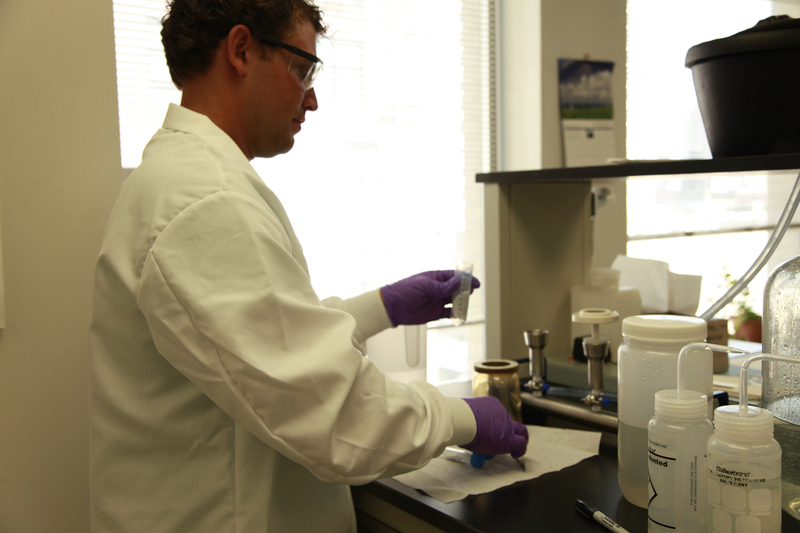 Past eDNA test results will remain valid, and because all water samples taken from the CAWS and Great Lakes are saved, past samples could be retested with a more advanced eDNA method, Baerwaldt explained. Having a better picture of the pattern of eDNA hits could be especially helpful for explaining positive hits like those from Lake Erie in 2011 and 2012. He added that, if many carp were in the Great Lakes, it is likely one would have been caught or seen jumping onto a boat. Both Chapman and Baerwaldt stressed that refining the eDNA method is a long process, but an important one.